Our exclusive Credit Union Social Media library includes 30 videos that can be used indefinitely. Use these videos on your web page, social media pages and for social media sponsored ads. They are designed to be short, catchy and with a single message. • 4X as many consumers would prefer to watch a video about a product than to read about it. • Viewers retain 95% of a message when they watch it in a video, compared to 10% when reading it in text. For a limited time, we are offering our entire 30 video social media library for only $3,000. This library will only be offered to one credit union per market, so don’t let one of your competitors get this amazing library first. Call Joe Miele 205-983-8803 or email joe@tvstuff.com today! Free customization: Text to your CU colors, add your logo and add a positioning statement. GRAPHIC: Are you current or former military? VOICE: You protected our country and our freedom, now let us show our appreciation. Ask about our special products and rates exclusively for former and current military. GRAPHIC: Need to smile today? VOICE: Things that make life better… Sprinkles on a doughnut… and great member service! Credit unions are different! Come and experience it for yourself! GRAPHIC: Call or stop by today! VOICE: Need a financial institution with that personal touch? We Just might be the right fit you’ve been looking for. GRAPHIC: Don’t have auto loan rate regret. VOICE: This is the look of a man who paid too much in interest for that auto loan. Before you borrow, checkout our rates! GRAPHIC: Get an auto loan quote today! VOICE: It’s definitely time for a new car..come see us for the best auto loan rates! GRAPHIC: On a house hunt? VOICE: Don’t drop the ball when it comes to buying a house, you might be able to afford more than you think! Call or visit us online for mortgage financing options. GRAPHIC: How low can our rates go? VOICE: Credit Unions on average have significantly lower lending rates. Before you shop for a house, think about financing through us! VOICE:Dreaming of that forever home? Well dream big! We can help that dream come true…for a lot less. GRAPHIC: Call and find out how! GRAPHIC: Saving Enough for Retirement? VOICE: Got some extra cash…remember you won’t be young forever! Visit us online to review our retirement savings options. VOICE: Whatever you’re doing, wherever you’re going, through online banking, we’ll be there to serve you! GRAPHIC: See how easy it is! VOICE:Need some extra cash to help with expenses? Have a house? It might be time for a Home Equity line of Credit. GRAPHIC: Why choose a credit union? VOICE: Feel like money is slipping through your fingers due to high banking fees? Save money by banking at a credit union! GRAPHIC: Become a member today. 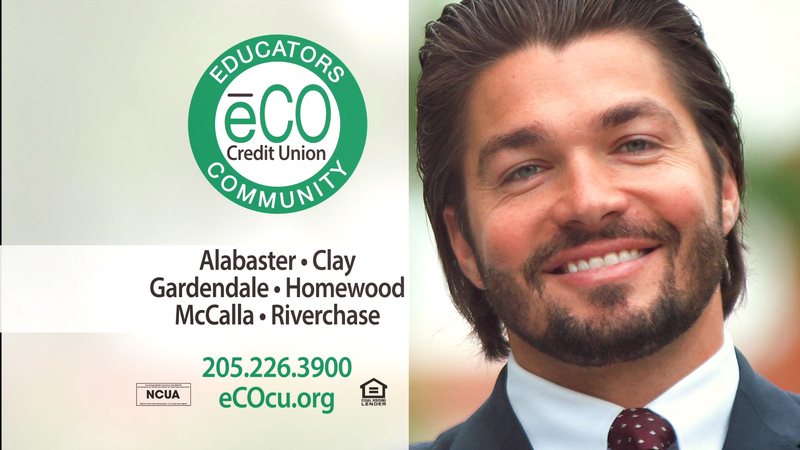 VOICE: When you bank at a credit union, we’re all on the same the same team…a winning team. Membership does have its privileges! GRAPHIC: Join out team today! GRAPHIC: Excited for the holidays? VOICE:It’s never too early to start thinking about saving for Christmas. We’ve got ways to help you SAVE! Inquire today! VOICE: Start your kids on the road to financial success now. Open a youth account for your kids today! GRAPHIC: Does your credit card suit your needs? VOICE: For emergencies, for surprises, or because you deserve a treat, we’ve got a credit card for you. Ask us about great rates and promotions on a variety credit products. GRAPHIC: Want to start tackling debt? VOICE:Start paying off the small debts and move to bigger ones. Get get the ball rolling! Our financial advisers can help you with ideas like this and more! VOICE: Ready to smash your payments down? Consolidate debts into one low payment through a Line of Credit or Personal Loan! It’s easy, come see how! VOICE: Direct Deposit is almost like magic. It makes you feel like the money you shuttle to your savings every month appears out of thin air. You may be pleasantly surprised by how much your account grows over time! VOICE: Save the date! If you don’t trust yourself to remember to pay your bills on time, set up online bill pay. It quick and easy, try it for yourself! VOICE: Mortgage rates are rising, refinance now before rates change! GRAPHIC: Refinance now before rates change! VOICE: We love to shower you with gifts! Flexible terms, cashback incentives & special rates are just the beginning of some of the great promotions and rewards our members receive. Become a member today! GRAPHIC: Become a member today! GRAPHIC: What’s Remote Deposit Capture? VOICE: What’s Remote Deposit Capture? Think of it as selfies for checks! Go on-line and checkout this new way to deposit checks today! GRAPHIC: Go online and check it out! VOICE: Tired of getting mad at yourself….over another overdraft charge. Get over yourself and get overdraft protection today! GRAPHIC: Get Overdraft protection today! VOICE: On Social Media it’s ok to be all thumbs! Give our page a like on Facebook! GRAPHIC: Want to stay up to date? VOICE: Want to stay up to date on products and services? A little birdy told us you need to get Tweeting! Follow us on Twitter TODAY! VOICE: Having nightmares about paying off Student loans?- Pay off college the smart way with great repayment options and competitive interest rates. Find out more today! GRAPHIC: Find out more today! VOICE: How can you make your Small business blossom? A Small Business loan can do the trick! Call us to see how much you qualify for. VOICE: Bad things happen, but don’t worry. We offer insurance to help you attain affordable, reliable coverage. Find Out More today! VOICE: The Best things in Life are free: Hugs… laughter…and CHECKING! Check out the benefits of our FREE checking accounts.